Other than purely theoretical astronomy, all astronomy depends on some kind of light (electromagnetic wave). Among ancients the most they could do was determine the position of stars accurately and relate their position to the rotation of the earth. Today, one of the most valuable instruments for really getting information about the star itself, is the spectroscope. How broad the spectral lines are, any shift in their position and the patterns of emission and absorption lines all tell us about the star. To get practical experience in how valuable this is, I had the youth group of the Spokane Astronomical Society build spectroscopes using the Mac and Cheese boxes common in 2002. We also had access to some grating material from my employer at the time. The only other supplies needed were some thick black paper and some black photographer’s tape for the slit and grating ends of the box. I created a worksheet which used the grating equation to figure out what angle the spectrum would appear at relative to the slit on the other side of the box. To test the results of our computations, we held a red laser (633nm) one mac-&-cheese-box-length away from a white board and marked where the light fell. Then we passed it through the grating onto a white board and marked where that light fell. Then we measured the distance between the two. I created several light sources to see the different spectra possible and provided this chart to classify what gasses were in those sources. In one presentation I made to the Young Astronomers of the Spokane Astronomical Society, I bought several dozen pair of red/cyan anaglyph glasses for a 3-d presentation. It starts at a popular park in the Spokane area called the Bowl and Pitcher. In our work life we always think our contributions to the end product are what matter. They aren’t. The thing you realize at the end of the day is that the only thing of any lasting importance is the adventures of the people you worked with. Although the cultural context in which my colleagues lived out their adventures was fully Japanese, it held the same fascination with the unknown possibilities that light up every young person’s eyes as they begin their career. We’re not always conscious of it but we all adopt well understood cultural roles in our workplace. At Subaru, these were Japanese rolls. The matronly woman who was mother to all of us; the slightly ditzy girl who hadn’t a clue but was so sanguine you couldn’t help like her; the driven genius who would meditate on a single problem for weeks before uttering a word and; the samurai stoic who knew more than anyone what rolls were being played and played Go with all of them. Although all of them were brilliant to the point of genius and all had doctorates, we were never allowed to call them “doctor”. We could use the honorific term “san” but if we said “sama”, which is a term of higher respect, they would wince. Whenever we made the slightest contribution; editing a paper for publication in English or add an idea to the discussion they would include our name in the publication. Thrown into that mix were several of us westerner’s with varying degrees of understanding, patience and tolerance who tried desperately to find a roll within the closed milieu of the Subaru club. Three of us, a young German programmer (I think he works at the Max Plank institute in Heidelberg now), a Hawaiian native (we’re still in touch) and myself decided that the best way to start would be to learn the language. We signed up to take lessons in Japanese in Hilo and tried using it a little at work. Word quickly got around and we all shared with each other how much of a difference we felt in how we were accepted by our employers and colleagues. We were invited to parties on weekends, introduced to honored guests and generally enjoyed a much closer relationship than those non-Japanese employees that felt the facility should have flown an American or Hawaiian flag. Working with people is never easy. It shouldn’t be. It’s getting outside ourselves and into places that are foreign that forges mind and soul into something worth living with. I will always be grateful to the people of Subaru who helped shape mine. I left Boeing in 1998 to live in Hawaii and shortly afterward was employed as a “research engineer” for the Subaru Telescope on Mauna Kea. I spent most of my time in the base facility in Hilo where I worked on three instruments being prepared for the telescope’s opening for its first science runs. The Subaru telescope is a Cassegrain telescope and has three places to put an instrument. The place where the secondary mirror is housed is called the primary focus, the Nasmyth focus at the point of rotation of the telescope and the Cassegrain focus at the bottom of the telescope below the main mirror. I worked on instruments for two of them. I spent most of my time on the IRCS instrument which still in service today and remains the go-to instrument for infrared spectroscopy. You can make out three housings of the three filter wheels in the center and the camera itself to the left of the instrument. The slits were on wheels on the other side of this optics table. This instrument was huge and was placed at the Cassegrain focus. The instrument I worked on at the Nasmyth focus was CISCO. 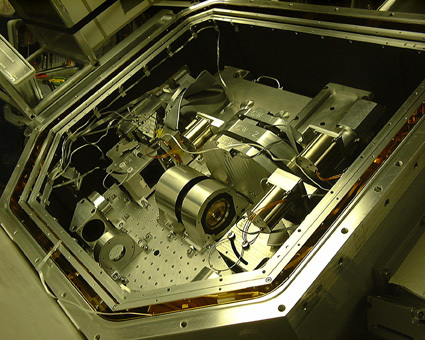 This is a spectroscope that detects near-infrared wavelengths. I had to go up to the summit to work on it and the biggest issue for me was remembering what to do with it in the haze of being at high altitude. Everything written was in Japanese and I had to create these drawings on photographs to take with me. They show just how complex it was and trying to remember what went where was half the job. 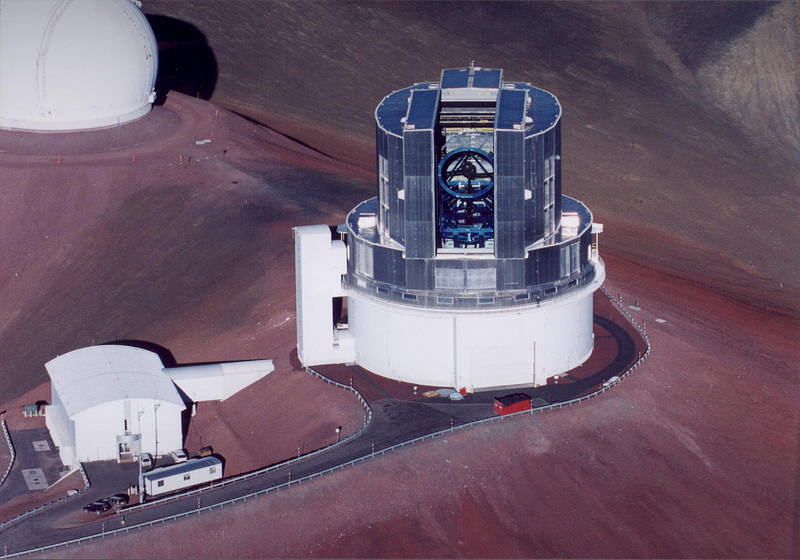 I also worked with the Adaptive Optics team but didn’t stay long enough to see it fully operational in 2001. The short time I spent as a researcher with the Subaru Telescope in Hawaii was among the most rewarding of my many careers. I have always held a romantic vision of work as a scientist without really understanding what the actual “work” would be like. It turned out I wasn’t very good at it, but that has not detracted from the warmth of my memories of that time. I was privileged to work on 3 instruments that needed to be prepared for “first light” (the first time a telescope captures star light): The IRCS, CISCO and AO. 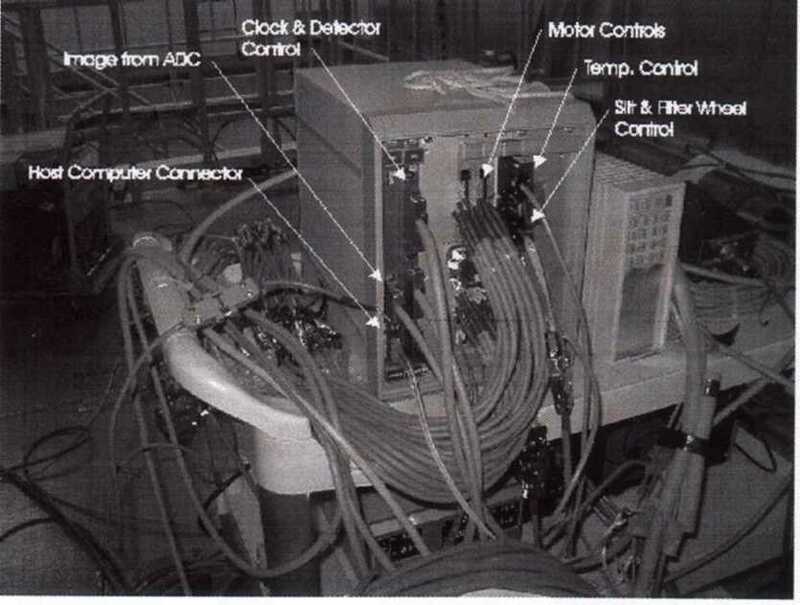 All of these used infrared detectors and my job was to work on the optics and cryogenics systems of these instruments. I didn’t stay long enough to have a routine, as such, but spent most of my time at the base facility in Hilo a few blocks from my home. The upper left part of the square outlined by the building has a highbay where the instruments w ere housed and worked on. My electronics bench was on the 2nd floor of the wing at the left facing the courtyard and the machine shop I used to make parts was just below me. I spent the majority of my time between these 3 parts of the building. Of course the warmest memories I have of working there are of the people. This was a very Japanese facility. People passed each other on the stairs on their right, not on the left as they do here. Teams took months to make a decision that would be made in moments here and people were genuinely pleased to be there with you and for you. All of this was taking place during the heyday of the 10-meter land based telescopes and the excitement was palpable. TV crews from NHK were a regular fixture there and the ceremony of having the Princess of Japan open the facility permeated everything we did. Everything was new (and expensive) and we all knew we were being watched carefully in the Japanese spirit of Gambatte. 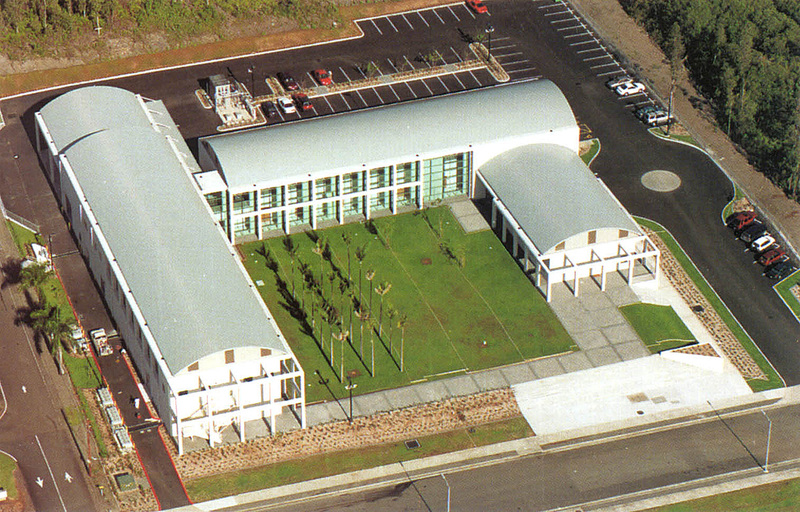 Of course the facility that all of this was built to support was the telescope on Mauna Kea. The peak of Mauna Kea is about 4,000 meters ab ove sea level (about the same as Mount Rainier here in Washington State) and is above almost 60% of the earths atmosphere. This is why the sky is so clear and useful for telescope observations. The downside to this is that people get altitude sickness and its hard to think straight if your on the summit for very long). For this reason, the telescopes on the summit all contribute to a way-station called Hale Puhaku at the 10,000 foot level to acclimate to the altitude (usually over night). What I remember most about this is that the food in the dining room smelled like airline food used to before they fully pressurized the cabins of aircraft. We all used to know what “airplane food” meant but that’s an old guy’s term now. 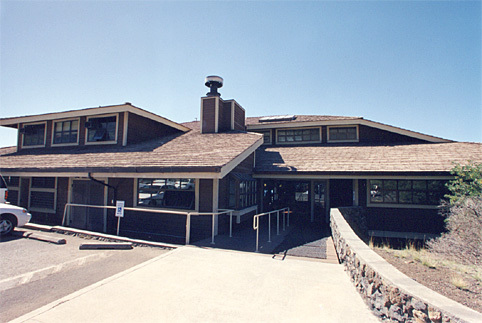 The summit facility was one of the most advanced facilities in the world at the time it was bui lt and is still one of the most respected facilities among professional astronomers. The building you see at the left is where the people are because you don’t want any heat reaching the dome. This would interfere with the infrared observations. Between these three facilities several great teams worked days and nights to perfect the capability of the telescope for scientists to use from around the world. As the calendar of observations filled up after first light we played host to some of the most brilliant astronomers in the world and some of the most brilliant minds from Mitaka, Japan where the Institute of Astronomy of the University of Tokyo is based. Hawaii itself is a state of mind. A dreamlike state of good and a nightmare of bad but always a little beyond the clarity of definition. I found an Island paradise of clarity within that dream among the science and the people of the Subaru telescope that has remained with me to this day. I was thrilled to hear the announcement that gravity waves had been detected by scientists at the LIGO telescope in Washington. When I lived in Spokane, Washington I was active with the Spokane Astronomical Society where I made a number of presentations about several exotic theories. Among these was the presentation I gave on INTERFEROMETRY which preceded a field trip by members of the youth group I had been tutoring. At the time of our visit in 2003, LIGO was still in its first engineering runs and only had hopes of what was discovered in September 2015. Among the tools I used to teach the students was a laser interferometer I built using a laser pointer.